When it comes to washer repair, there is a huge array of different styles and models. Sometimes it's even difficult to identify who is the manufacturer of your washer when it needs repair because of the many department stores that have washers made especially for them with their specific name in mind. There are a few things you can look into fixing yourself before calling for washer repair. This will save you time and money. As silly as they might sound, they happen often in our field of work. If your washer is totally non responsive you might want to check if it's plugged in or might have blown a fuse in the fuse box inside your apartment or outside your house. If your washer is leaking you will want to check the drain hose, making sure it's properly connected to the drain and does not have any cracks. If your washer keeps filling up with water for a long period of time and never switches to the agitate cycle, you will need to check that the drain hose is placed at the right height. When installed too low or placed too deep into the drain there is a natural siphoning effect that occurs that does not allow the washer to fill to the appropriate amount before switching to the next cycle. When all else fails, and you need to have someone repair your washer, call us at (506) 872-9956 or submit your request on the Contact Us page and we will have a washer repairman contact you promptly to assist you with your problem. Our customers are our greatest asset and your recommendation to your friends is you’re your greatest compliment to us. We are more than happy to answer any questions about washer repairs that you might have. Inspect the hoses and fittings on your washer. Make sure the hoses aren't cracked or blistered, the fittings aren't becoming corroded and no water is dripping. It's a good idea to replace the hoses and fittings as part of regular washing machine maintenance every 3 years or so, even if you don't see any problems. Level the washing machine. Use a carpenter's level and adjust the machine's feet until the bubble indicates the washing machine is level. A washer that bangs around with every load needs to be leveled before it breaks down. Keep the exterior of your washing machine clean. Soaps and bleaches usually won't damage the exterior of the washing machine, but stain removers and other chemicals you might store on top of the washer might. Clean the tub of your washer. This should be done every three months. Set the washer on hot, and if there's a setting for extra dirty clothes, choose that. Let the tub fill with water, then add 3 cups of white distilled vinegar and a 1/2 cup of baking soda. When the tub begins to drain, advance the cycle to spin. After the cycle ends, set the washer to cold and run another cycle. Flush your washing machine dispensers. If you can remove them, do so and soak them in hot water. While they're soaking, clean out the gunk that collects around them and between the top of the washer and the tub. If you can't remove the dispensers, pour hot water through them until they're clean for good maintenance. Use less detergent and fabric softener in your washer. Your clothes will get just as clean with half the recommended amount. Dilute your fabric softener with water or try using white distilled vinegar instead. Generally, liquid detergent is better than powder. Get a service call as part of your routine washing machine maintenance. The life of your washer may be extended if you have a service person remove the front cover and clean the inside of the washing machine. You can also do the job yourself if the washer is a top loader and you unplug it first. Never try to remove the front panel of a front-loading machine. And never try to remove the rear panel of any washer. 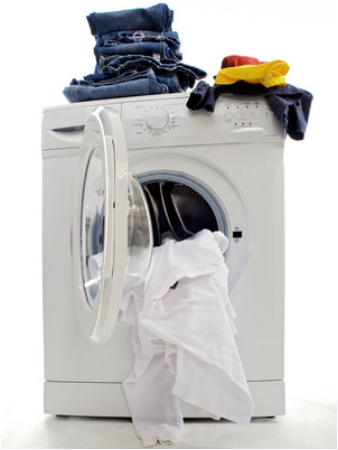 Washing machines get clothing clean by plunging the clothes through the water and detergent mixture. It is the motion that really helps to loosen dirt. In the old days, they used to beat wet clothes against a rock to get them clean. In top loading machines the agitator twists back and forth pulling the clothes down to the bottom of the tub. The clothes then work their way back up to the top where the agitator grabs them again. In a front loading machine, the clothes tumble and are plunged into the water over and over again. After the water is pumped out, the inner drum uses centrifugal force to wring out more water from the clothes by spinning at several hundred RPMs. The design of washing machines vary by manufacturer, but the general principles are essentially the same. The controls consist of a timer, cycle selector mechanism, water temperature selector, load size selector and start button. The mechanism includes the motor, transmission, clutch, pump, agitator, inner tub, outer tub and water inlet valve. The washer has two tubs, the inner tub with hundreds of holes in it and the outer tub which holds the water. During the spin cycle the inner tub spins, forcing the water out through the holes to the stationary outer tub. The cycle selector controls may include separate or integrated controls for water temperature, water level, cycle selection and a start switch. A lid switch, which indicates whether the lid is open or closed, will interrupt some or all of the washing machine operations. The water inlet valve connects to the water supply of your home and allows hot and cold water to flow into the tub. The agitator is in the center of the inner tub. During the wash cycle, the agitator rotates back and forth (about 3/4 of turn) to pull the clothes through the water. At the conclusion of the wash cycle, the water is pumped from the outer tub and into the drain though the drain hose. The pump, agitator and spin drum are driven by the motor. Some washing machines use direct drive, in which the motor is connected directly to the pump and transmission. Other machines uses a belt drive in which the motor drives the transmission through a pulley and belt. On belt driven machines, the pump is typically connected to the motor by a flexible coupling. The transmission drives both the spin of the inner tub and the back and forth motion of the agitator. Your washer has either a single direction or a reversing motor. With a single direction motor, an electromechanical device controls whether the transmission drives the agitator or the drum. Reversing motors control the drum when they spin in one direction and the agitator when they spin in the other. Most washing machines use a clutch to reduce the force generated by fast starting motors. The clutch allows the transmission to grab the drum or agitator in a gradual manner rather than all at once. Some washers use a clutch mechanism while others rely on slippage and gradual tension of the belt and pulley.